I recently joined the Valley Toastmasters club in San Jose, CA, at last ticking that off my lengthy personal development ‘to do’ list. Like all of life’s endeavours these days, naturally I Googled ‘Icebreaker speech’ as the first speech in the Toastmasters’ program is called. I found the tips and sample speeches helpful, so I wanted to share my speech and experience in the hope that you will find it useful. Elsewhere I found the more reassuring “if you get up, say something and sit down, you have succeeded”. Sometimes I love a low bar. How many words / pages should I write? This was my first question and I found that two single-spaced pages, approximately 700 words, took about five minutes to speak clearly. After I wrote the speech I found it helpful to record myself practicing it to get the timing right and to identify problems. I picked out key words as prompts and put them in big font size on a slide deck PDF on an iPad, which I put on a stand on the lectern, so I didn’t have notes to drop or fiddle with, could easily swoosh between screens if necessary and the iPad could barely be seen by the audience. As I prepared the speech at the last minute, I was able to include timely content, quotes from Maya Angelou, who sadly had died that morning. So here is the transcript of my speech. This was, of course, my intended speech. Add copious ‘ah’s and add and remove random chunks of content and you get the delivered speech. Mr/Madam Toastmaster, fellow members and guest(s). So, like all of you, I am the sum total of my experiences and I would like to share some of those with you today. I am from a small town in the west of Ireland, where everyone knows everyone. I thought the whole world was like that. It is a friendly, welcoming place, and as children we played traditional Irish sports, dance and music and to this day, everyone is expected to produce a song or dance on demand, so you have been warned, should you ever visit Ballyhaunis, Co Mayo. Like most small towns, when you finish high school, you move to a city for work or college and I moved to Dublin to attend university. The country girl in the big city, I quickly learned things like making eye contact with strangers in the street could lead to complications rather than salutations as it had done in my home town. Awarded a scholarship to spend a year in university in Spain – a dream come true – I was exhilarated by the independence and newness of living abroad. I also loved the fact that no one knew anything about me, and any success or failure I had was all of my own making. I soaked up everything I could about the language and culture of Spain and Asturias, the region where I lived, quickly learning that Spain, like most places, has strong regional cultural identities, far from the homogenous country we might think it is. After a few more years living and working in various parts of Spain, I returned to live in Ireland, taking a circuitous route via the UK, USA, Australia and Asia. As I travelled west all the way around, I think I am one day younger than it says on my passport! Since then, I have taken every opportunity I could to travel, adding Europe, South America, Africa and the Caribbean to that list, and most recently your own fabulous Hawai’i. In July last year, my husband’s employer, which is based in San Jose, asked him to transfer to work here and we took the opportunity to have this new life experience here in California. I was born on a Wednesday, so the traditional verse suggests that I should be full of woe. As an imperfect perfectionist, that is often the case. My birth order, the only girl born after five brothers, suggests that I am outgoing, fun-loving and attention-seeking – well, I am standing here looking for your attention, so maybe that’s true too. I certainly have the traits of a Gemini, open-minded and therefore prone to indecision, interested in absolutely everything I encounter and therefore sometimes lacking focus, like for example when it comes to writing a speech. More than anything, I have an insatiable thirst for knowledge and understanding. The desire to know and understand is what drives my wanderlust. I love nothing more than to spend time in a new country and culture, soaking up the sights, sounds, smells and tastes and getting an appreciation of how other people live their lives. 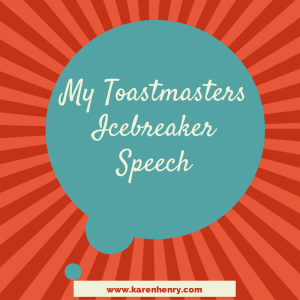 If you are doing or have just done your Toastmasters Icebreaker speech, I would love to hear how it went – leave a comment to let me know. Thanks, Karen. It went very well! Glad I gave it my best shot. Thanks Karen. My next speech is *gulp* this coming Thursday. Wish me luck!